I call it the Crown Heights "love affair" (for lack of better words) as opposed to the Chabad "love affair" because it is a hakpada that is primarily found amongst Chabad sofrim from (or trained in) Crown Heights, as opposed to Chabad sofrim from Erertz Yisroel and other places. It is fair to say that different groups have different things they are machmir about (ie the Litvish are into klaf avodas yad, Satmar are into Bli Bechiros etc). And the fact that in recent years Chabad sofrim from Crown Heights are way more makpid when it comes to doing the tagei lamed correctly than anyone else (right higher than left - without exception - even when other hiddurim and lechatchillah aspects are blatently overlooked) IS A GOOD THING. True, all good sofrim are makpid to write the tagei lamed properly - with the right tag taller than the left tag. After all, it is brought down in the Mishnah Brurah as a lechatchillah leksivah - just like the oketz on the middle head of the shin or the oketz on the back bottom of the aleph. In Shulchan Aruch Harav it is not brought down as lechatchillah leksivah but as "sod'. This would be in the same vein as other kabballistic diyukim and hiddurim and most similar to the Shulchan Aruch Hrav's mention of the right side of the chottoteres of a ches being thicker than the left side. (The reason I say most similar is because they both come from the same kaballistic concept of chesed overriding gevurah). And they will do it even on cheaper mezuzos which may not have all of the lechaltchillah leksivah requirements - and certainly not all the kaballah requirements. Yet what puzzles me is that many of these magihim, who should be commended for their detail of the tagei lamed, will often ignore things that are of greater halachic significance! In my opinion, if you are going to fix to such perfection - fix everything!- and certainly things that are more chomur from a halachic point of view. It seems odd to fix all the tagei lamed but leave blatant cases of, for example, sofek kav moshuch or lamedim that have short necks - both of which are examples safek psul - which are of far greater concern than missing lechatchillah leksivah details. And finally, for those who argue that because it's "sod" it has greater spiritual powers than halachic stringencies - why then are these magihim focussing only on the lamed and not the ches? They should place equal emphasis on the ches - which is also "sod' and carries the same spiritual rationale of chesed over gevurah. It is, after all, also brought down by the Alter Rebbe. Yet they do not give it the same emphasis. I see for myself many of these mezuzos where the lamedem has been oviously fixed (with bolet "I was here" tikunnim , the ches has not been touched. Furthermore, one would think that from a spiritual point of view it is far better that the person has kosher lechatchillah mezuzos, than kosher bedieved mezuzos with fixed tagei lamed. Fix the bedieved's first! Don't get me wrong - I think fixing the tagei lamed is important, and I do it all the time. However its important that everything is kept in correct context. PS - ADDITIONAL THOUGHT: (someone sent me an email with the following argument). 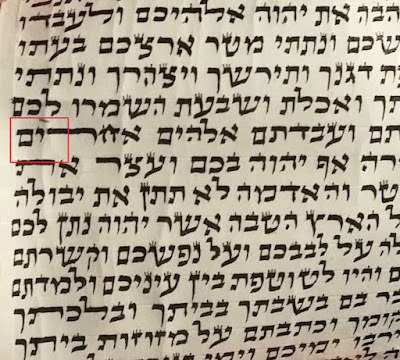 While halachically it is permitted to use a rapidograph for minor tikunnim such as oktzim and other lechatchillah leksivah touch-ups by a magiha, one could argue that if one is repairing tagei lamed because it's "nachon al pi hasod" it seems like a bit of an oxymoron to repair on that basis using metal, which is in itself is considered dubious al pi hasod. I should think that there is merit to this argument. True, there is someone in crown heights who people turn to for help, and he tells them to have their mezuzos checked, " and make sure with the sofer that the tagey lamed are fixed", I even had some in Montreal tel me to do so in his name. Reb A.B. Yerushalmi chashuve yid that moved to the USA relate to me the following story: I purchased expensive mezuzos from a known sofer. He then brought the mezuzos to a baal magia who pointed out that although mehudar the tagai halamed are not done properly. Reb A.B. went to ask Harav Elyashiv. The answer was "IT IS A SAKANA AND SUCH MEZUZOS MAY NOT BE SOLD"
So it still does not explain why 99% of magihim are not makpid to fix tagei lamed. If it's indeed so important whyis this the case and why are big rabbonim in Stam saying its not obligatory to fix. R' Eli, thanks for this. Now I understand why a Chabad sofer I supply requests that kasher lebracha mezuzahs have tagei Lamed and that the right is taller than the left. I found it surprising that this would be of concern while things that aren't lechatchila don't seem to. An avreich who learned in Rav Friedlander's kollel and was close to him moved back to the US. As a chaver of mine (from the kollel and in yeshiva prior) he faxed me some of his mezuzahs to take a look at. (This was b/f e-mail.) There were some short Lameds (bedieved) and some didn't have the tagin done correctly. At the time he couldn't afford to replace them but Rav Friedlander told him that in the meantime to fix the tagei Lamed to gain the chesed over gevura. (Apparently there were some health issues at home.) However he should replace them for lechatchila mezuzahs when possible. I question whether he'd have suggested to fix the tagin had there not been a health issue. I've never heard from Rav Friedlander that Rav Elyashiv said that "it's a sakana and can't be sold". If he held it was a sakana then he'd also likely have held that they must be fixed, no matter the level of kashrus of the ksav and I've never heard either. I will have to ask Rav Friedlander about it. My policy regarding new and used mezuzahs is to be very makpid on tagei lamed on anything which is b'geder mehudar. Some poskim who allow the use of a rapidograph do not allow the ikkur ksivah to be done with such an instrument, and say for the ksav to be mehudar it must be written with a kulmus, however they allow rapidograph for minor tikkunim such as oktzim, tagin , i.e. things which are added to make a mezuzah more lechatchillah or meduyak. And the mezuzah would still be halachically mehudar even though a rapidograph was used for such tikkunim. 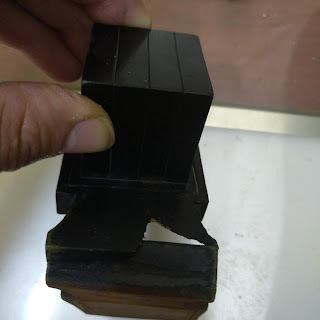 However the point was raised, that the main gripe opponents of the rapidograph have is that it is a metal nib which is frowned upon al pi kabollah. So if you are fixing things such as tagei lamed for their kaballistic value, it is a bit illogical if not downright hypocritical to do so with a rapidograph. Just something to think about, I guess, I'm not a posek but it is a valid point. My suggestion is if you are going to fix the tagei lamed you should do so in a separate hagoha (otherwise you will miss other things because you are focussing on the lamedim, or vice versa). So my suggestion is do the regular hagoha with your rapidograph and the tagei lamed hagoha with a thin, sharp kulmus. When I did shimush in Crown Heights, I heard from several veteran sofrim, that there were many stories where the Rebbe told people to make sure that their stam had tagei lamed and the right be taller than the left. I believe that this is why a very big deal is made of it in Chabad. But I agree with you that it seems strange to be makpid davka on this hiddur with mezuzos that are lacking in much more basic things. It would be worthwhile for someone to do some research and find out if these answers from the Rebbe were to people who already checked their Mezuzahs and the sofer said they were fine? Or if the Rebbe said it as a first answer. The way I heard the story was that a prominent Chabad Chossid received instruction from the Rebbe to check his tefillin and mezuzos. He brought it to a reputable sofer and everything was found to be 100% fine. But soon received another instruction from the Rebbe to repeat the process. He was puzzled because he had just had them checked so he brought them to a different sofer, and still nothing was found to be wrong. Again, the Rebbe instructed to check. This time he brought it to a third sofer who said the only chisoron was the tagei lamed were all left taller than right, so he fixed them. After that, the Chossid stopped receiving instruction to check. To the best of my knowledge there was never a public instruction or printed letter from the Rebbe on this issue. I've never heard anyone (suggest to) davka add/fix tagei Lamed with a kulmus. The fact is that there are numerous things al pi sod or while based on Chazal have sod associated with it so I don't see any reason to make a chiluk. 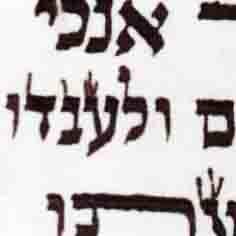 If you find a reparable psul (lechol hadeos) such as a severed letter do you fix davka with a kulmus? What about a psul she-efshar lesaken? I spoke with 1 of the top magiim (who customers are mostly talmidei chachamim seeking the most mehudar) and he uses the rapidograph for the above tikkunim (with sofer's diyo). This seems to be what most magiim do, including top magiim, other than a few old timers who predate the rapidograph. Part of the reason for using the rapidograph is due to the risk in using a kulmus. I agree that with any mezuzah or parsha that has a specific problem that requires repeated corrections that this should be done separate from the main hagaah. I fix an actual (repairable) psul such as nifsak with a kulmus. This has been my policy for quite some time now. I only use the rapidograph for minor tikkunim such as oktzim, tagin , i.e. things which are added to make a mezuzah more lechatchillah or meduyak. The only exception are old sifrei torah which will have a staus of bedieved even after repair.